Busch needed four extra laps, but held off Joey Logano and Kevin Harvick in a green-white-checker finish Sunday to capture his fourth victory inarow at the Brickyard 400 at Indianapolis Motor Speedway. Rounding out the top 5 was Martin Truex Jr and Denny Hamlin. 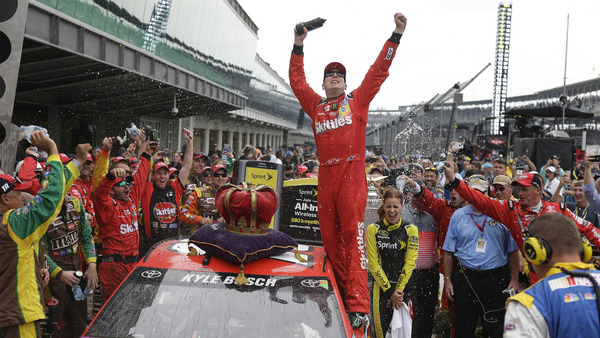 Busch know has a very memorable Brickyard victory to add to his win total. Busch,who also won the Xfinity race Saturday at Indianapolis, has moved 23 points away from cracking the top 30 in points. Roger Penske was unable to capture his first Brickyard 400 win when driver Joey Logano finished second to Busch. Clint Bowyer lost control of his car on a restart with 111 laps to go and crashed, which caused Jeff Gordon to spin and wreck in his final Brickyard start. He lost five laps as a result and ended up having to go to the garage for repairs. Gordon made it back out to salvage some points, a crushing blow in his pursuit of a Chase for the Sprint Cup championship berth. Gordon is winless in his final full season and will need a checkered flag over the final six races before the cutoff to make the 16-driver field. Two-time Brickyard winner Tony Stewart was strong early but strategy backfired and he finished 28th.